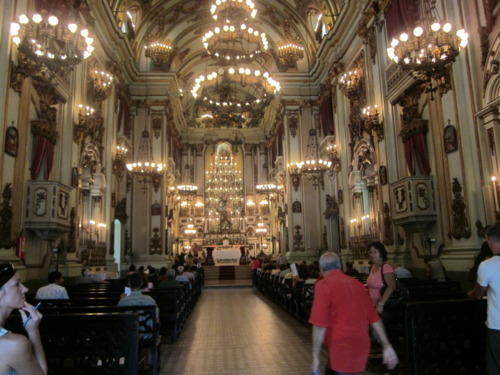 The church stands beside the Tiradentes Palace and the Imperial Palace, a few meters from the Church of Caramel (they feel quite similar inside). 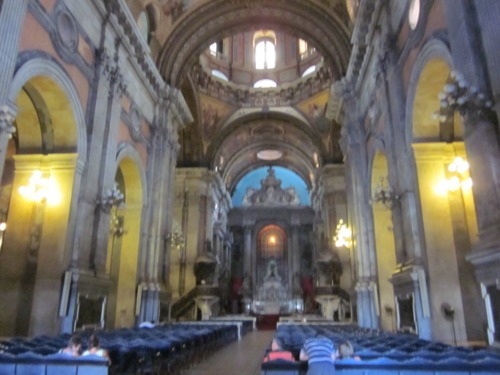 Work on Irgeja de Sao Jose began in 1808, and was completed 34 years later. The bells are known for making ‘the most sound of the city’. After the seeing the beautiful churches (see my last post), it was time for a ‘snack’. 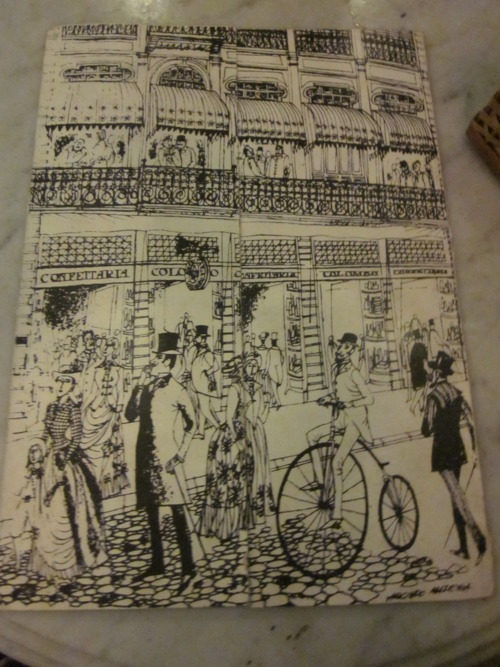 We headed to Confeitaria Colombo, a well known Belle Époque’ tearoom that opened its doors in 1894; quickly becoming the ’ rendez-vous’ place of choice for Rio’s high society members. 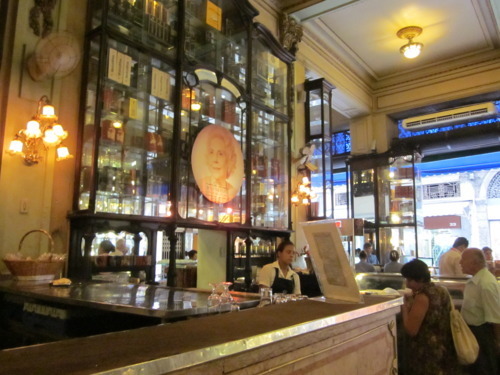 The ornate late 19th century decor really did remind me of Belle Epoque Paris — or a painting by Monet. 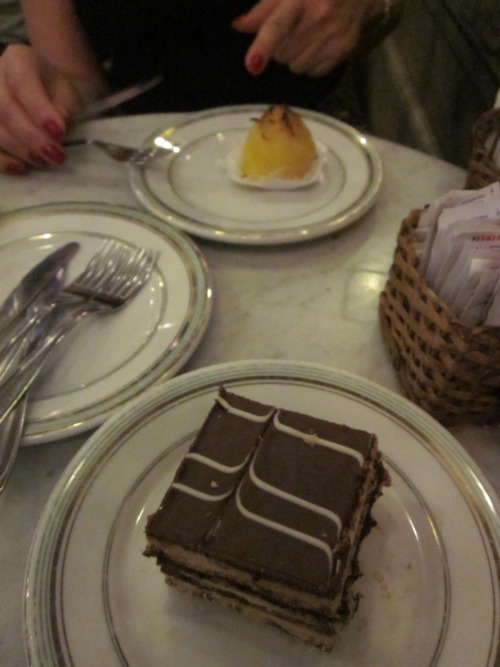 At the front of the restaurant is a bakery and candy shop so you can see all of the wonderful goodies right away. The very high ceiling (which has a stained glass circle in the center) is ringed by a balcony of people who want something more than just a snack or sweet. The room itself is surrounded by enormous Jacaranda-framed mirrors which are absolutely stunning! 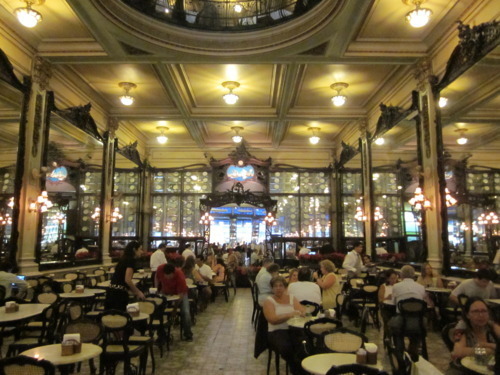 In a city that has replaced much of the old with less attractive modern construction, Confeitaria Colombo was a welcomed surprise. 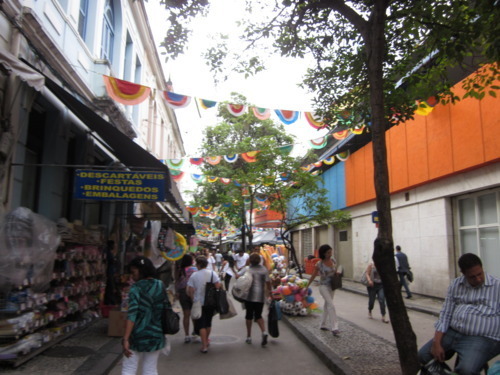 Then it was off to Saara, which is like NYC’s Chinatown during a New Year festival every day. Syrian, Lebanese, Greek, Turkish, Jewish, Spanish, Portuguese and Argentinean immigrants are among the pioneer merchants in what is known as ‘Saara’ and thousands of people fill these streets daily. Saara (ie Chiantown) is a mixture of all sorts of vendors. On the street level there are tons of different merchants selling everything from different foods/spices to clothing and home goods. 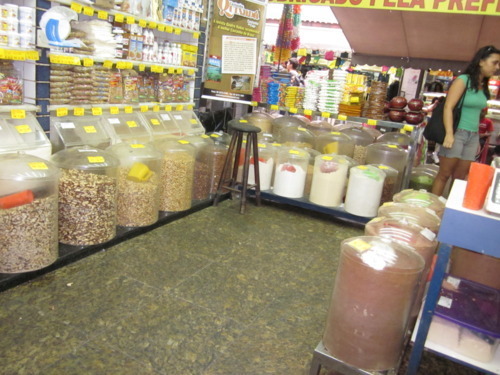 As you can see from the picture below, this store had containers of everything you could think of (olives, cherries, cake decoration sprinkles, spices etc). Very convenient to do a ton of shopping in one place, and everything here is 10times cheaper than the rest of the city. 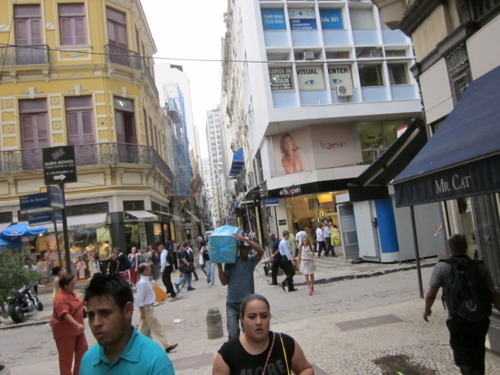 However, beware… these little stores are VERY hot (no ac here), get crowded and there are flies buzzing around. 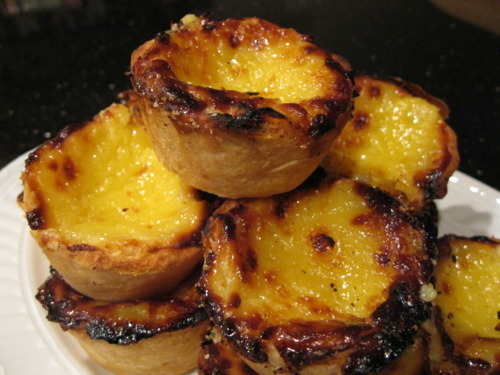 In general, because of the bacalhau it doesn’t smell great…wouldn’t want to be here on a really hot, crowded day! The second stories are old art deco buildings that are falling apart. If you stare at it long enough you can see that once upon a time they were beautifully colored buildings. We were going to explore the National Library but since Obama is coming to town this weekend people were ‘practicing’ their protests in the square…so decided to call it a day and we will venture downtown another day. and scattered in between the side streets are older very cute(but falling apart) art deco buildings- what Rio used to be back in the day. It’s rather unfortunate that they are not being restored, through the decay you can see they were once all beautiful bright colored buildings. 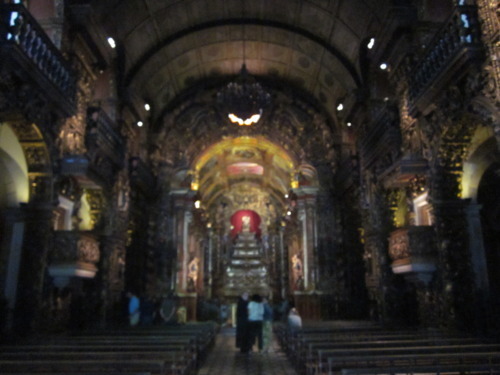 The first was Igreja da Candelaria (Church of Our Lady of Candelaria) shown above. 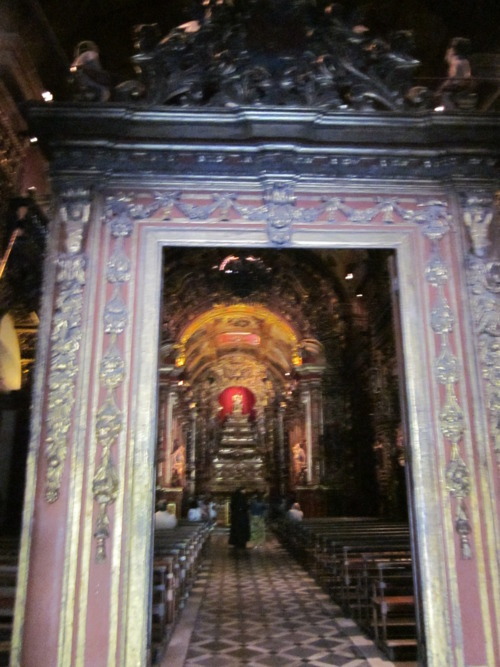 Some history for you: In 1608 there was a ship named Candelaria that survived terrible storms finally docking in Rio; thankful for their survival the couple on board built the chapel (naming it after their ship) in 1609. 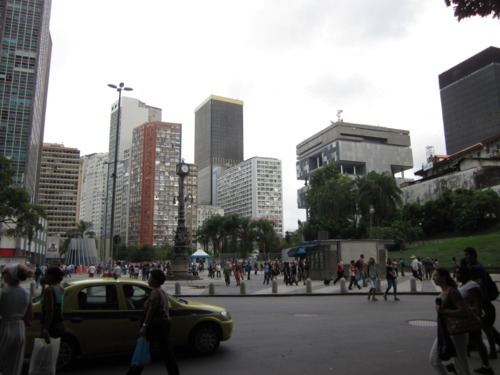 The facade faces the Bay of Guanabara (gorgeous view). 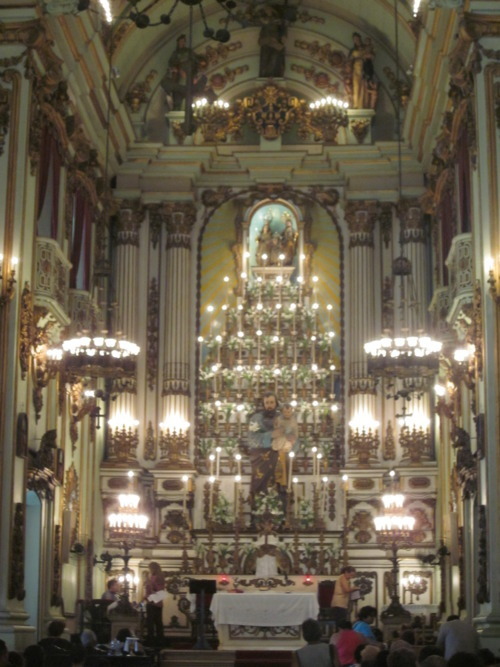 In 1878 Antonio de Paula Freitas and Heitor Cordoville began decorating the interior of the church, following an Italian neo-Renaissance model, with Italian marble flooring, polychromatic walls and columns. 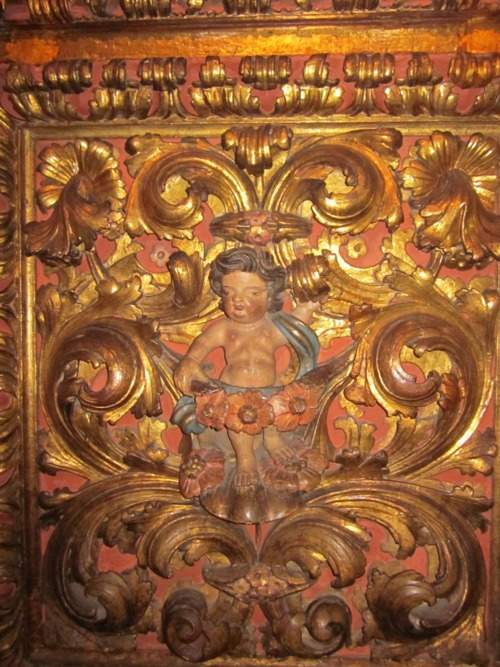 The angels holding up the staircases are absolutely stunning. 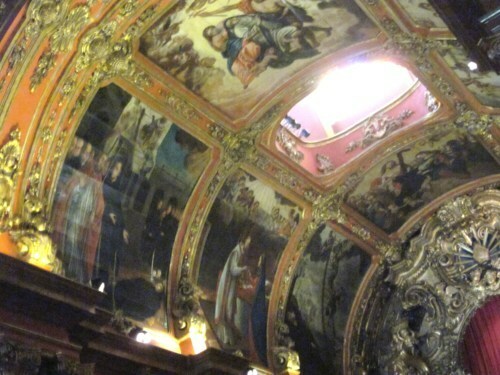 The magnificent wall paintings inside the Church were created by Brazilian painter João Zeferino da Costa and were distributed through the roof, aisles, dome and chapel of the church between 1880 and late nineteenth century. 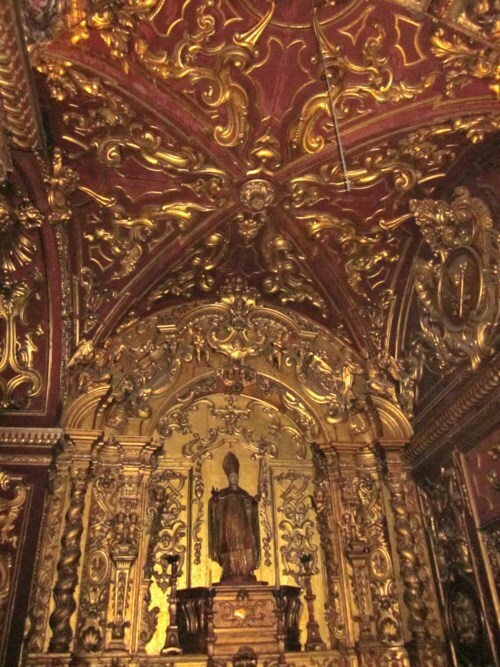 The incredible detail on the roof of the nave are 6 panels dedicated to the early history of Candelaria Church, since the founding trip until the first consecration. 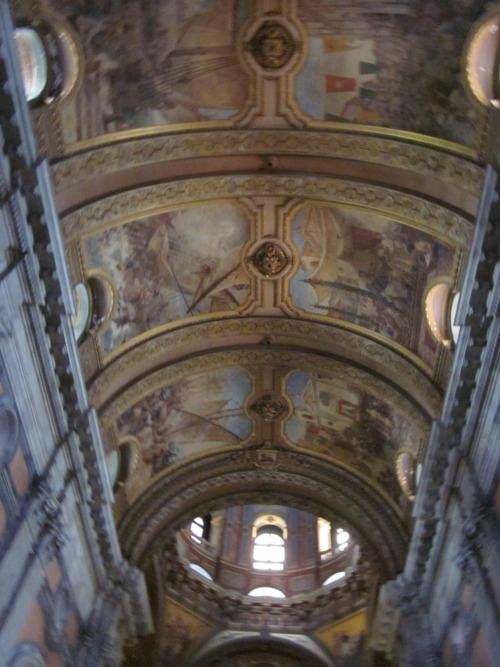 The paintings on the dome represent the Virgin and symbols of the Old Testament. When inside you feel transported to another time. 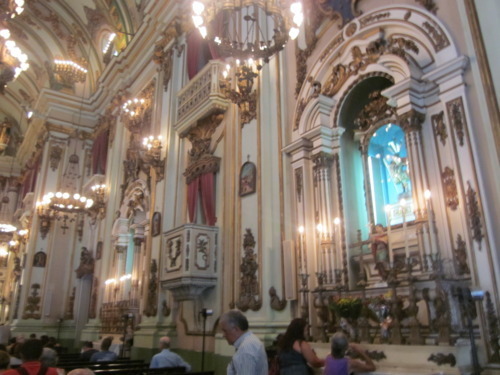 The church interior is rich, fully lined with a gilded style that goes from the Baroque of the late 17th century to the Rococo of the second half of the 18th century. 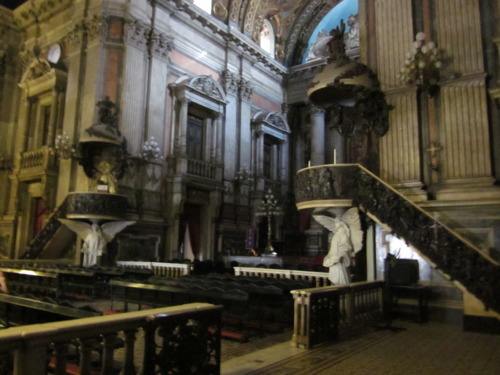 The first sculptor active in the church was the Portuguese monk Frei Domingos da Conceicao. Look closely, and you can see how incredibly detailed every inch of the entire interior really is.